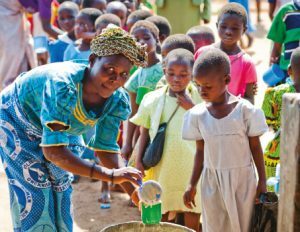 Joe Black from Mary’s Meals shares with us more about their work, the impact it’s having across the globe and how BB Companies can get involved. Mary’s Meals is a charity with a simple vision: that every child receives one daily meal in a place of education. Very often, chronically poor children don’t attend school because they are begging, working or searching for food, or are too hungry to concentrate in class. Mary’s Meals is a global movement that sets up school feeding programmes in some of the world’s poorest communities, where poverty and hunger stand in the way of children gaining an education. By providing one daily meal in a place of learning, Mary’s Meals enables impoverished children to attend school, where they receive an education that can offer a route out of poverty. That moment was a key part of the inspiration leading to the founding of Mary’s Meals, which began by feeding just 200 children at a Malawian primary school in 2002. Today, Mary’s Meals is reaching more than 1.2 million children with a nutritious daily meal in places of learning in 14 countries including Malawi, India, Syria, Liberia, Haiti, and South Sudan. It costs just £13.90 to feed a child for a whole school year with Mary’s Meals. Wherever possible, Mary's Meals uses locally grown food to support the local economy and engages community volunteers to prepare and serve the meals. In Malawi alone, there are more than 80,000 registered volunteers who cook fortified maize porridge for the children. Mary’s Meals works hard to keep running costs low to ensure that at least 93p of every £1 donated is spent directly on charitable activities. This is only possible because most of this work is carried out by dedicated volunteers. 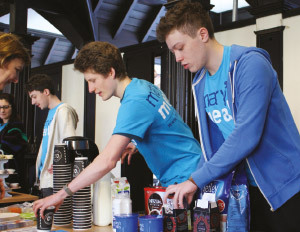 Young people play a huge role in supporting Mary’s Meals and raising awareness about the charity’s work. BB groups across the UK think of all sorts of ways to help. The 1st Bromborough Company filled empty Smarties tubes with 20p pieces and arranged a sponsored walk, raising enough to fund daily meals for every child at Mocho Primary School in Malawi for a whole school year! Blair Anderson from Kilsyth in Scotland started fundraising for Mary’s Meals with 3rd Kilsyth Company in 2010, to mark the Company’s 60th anniversary. The whole Company pitched in with supermarket bag-packing over Christmas and New Year and a Christmas card delivery service around their town and neighbouring villages. The Company’s fundraising was a huge success and, having raising enough to sponsor the building of a school kitchen in Malawi, some of the Company visited the school to meet the children receiving Mary’s Meals there. 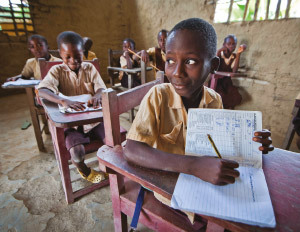 Many children receiving Mary’s Meals don’t have basic learning tools such as pencils and notepads. You can support them to get the most out of their lessons by donating a backpack full of the things they need. For many children, a Mary’s Meals backpack will be the first gift they have ever received. Find out more at at marysmeals.org.uk under ‘Get Involved’ and ‘Campaigns’.